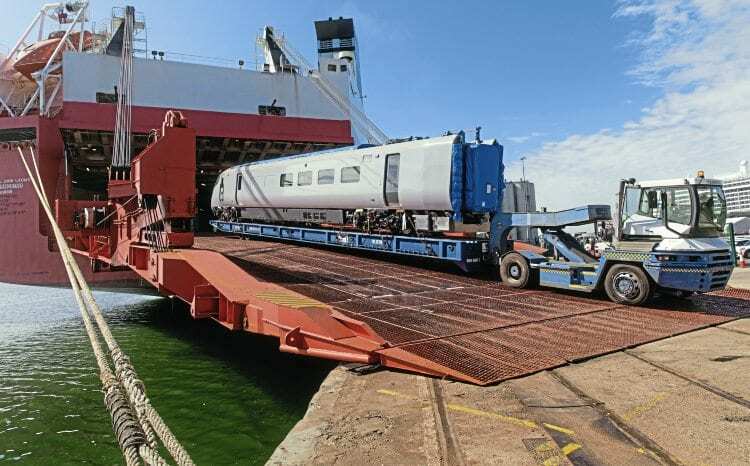 THE first of 19 Hitachi Class 802 Intercity Express Trains (IET) destined for use with TransPennine Express, was unloaded at Southampton on June 11. This followed a journey from Japan that began in April and included passage via the Pacific Ocean and Panama Canal. Set No. 802201 has been moved by road to Hitachi’s Doncaster depot from where it will undergo commissioning tests ahead of introduction on the East Coast Main Line from 2019 on services between Liverpool, Manchester and Newcastle to Edinburgh. The bi-mode sets have been branded ‘Nova 1’ by TPE, and feature an uprated MTU engine, rated 940hp. Each set will have 342 seats (318 standard, 24 first) providing an increase of 161 over a three-car Class 185. Features of the trains will be power sockets at each pair of seats, a traffic light system for electronic seat reservations, space for five cycles, and wi-fi. These sets are similar to the five ordered by Hull Trains to replace the Class 180s, with a second TPE set due to arrive in late summer from Kasado, Japan. The rest of the fleet are being built at Pistoia, Italy. All sets arrive in a white livery ready for application of vinyl branding. TPE set Nos are 802201-219, and Hull Trains are 802220-224.